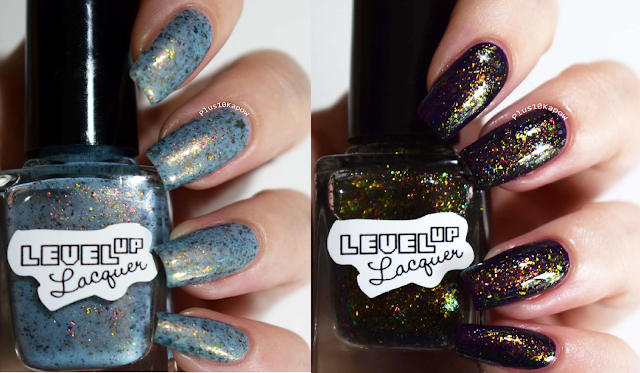 I told you that the extras that Ash from Level Up Lacquer sent me were awesome! 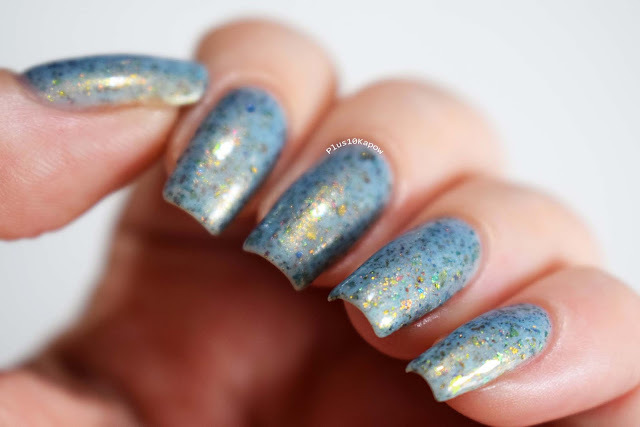 There is still one more post to come after this one which will be in a couple of days, but today I am showing you Temporal Flux and Dark Matter from the Intergalactic Flakie Collection. After these and Crazy Ice King from Danglefoot Nail Polish, I'm really starting to buy into the whole flakie thing. Also, can you internet peoples please stop making amazing things? Please? Temporal Flux is blueish grey crelly with a holo micro glitter and chameleon flakies. This polish was perfect in 2 coats, it dried fast and smooth with a slightly matte finish. I added one coat of Seche. 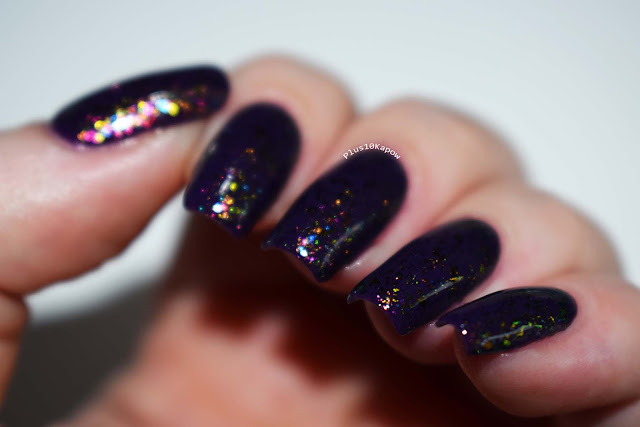 Dark Matter is an amazing chameleon flakie with holo glitters. 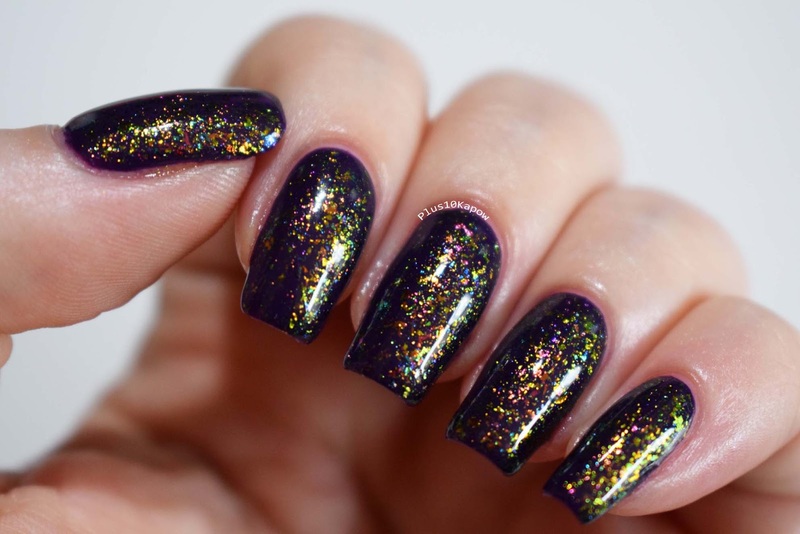 I layered one coat of Dark Matter over Barry m Plum because I'm really starting to love how flakies look over dark colours, but this would look great over light colours too and it can be built up itself in 3+ coats. It dried speedily and to a slightly bumpy finish, I added one coat of Seche. These two are such beautiful polishes and yes, Dark Matter is my favourite of them because it's amazing, just look at it, you can't not love how lush it looks. It's like a rainbow on crack! What do you think of the whole flakie trend?